120 days. Tragopogon porrifolius. Plant produces large 8" long by 2" wide salsify roots. Looks similar to a carrot with oyster like flavor. 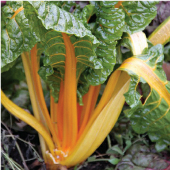 Used in soups and steamed or sauteed in butter. Known as the Vegetable Oyster because it has a taste when cooked that is similar to oysters. United States Department of Agriculture, NSL 6405. Salsify also called Oyster Plant and Vegetable Oyster. 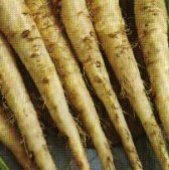 It is grown like Parsnips and is one of the hard to grow root vegetables. Salsify need a finely cultivated soil, preferably sandy soil. Work the soil to a depth of 1 to 1 ½ feet so the soil is loose. Planting should immediately after last frost. They can not take the mid-summer climate, so plant early spring of in the fall. The deeper the soil is tilled, the longer the roots will develop. Plants are 8" to 12" tall. 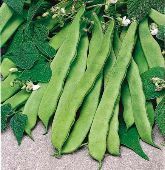 Requires loose fertile sandy soil in a well drained location in the garden. Apply much, and grass clippings, or straw around base of plant. Use plenty of manure and compost for large roots. Keep soil uniformly moist and from drying out. Keep watered during dry and hot spells. Dig or pull roots when they are 8" in length.